Earlier this month Justin and I set out on an eleven day road trip throughout the Midwest, something we had talked about doing for years. I’d always heard incredible stories and seen beautiful photos, but had never visited these parts of our country despite my great love of adventure and being outdoors. 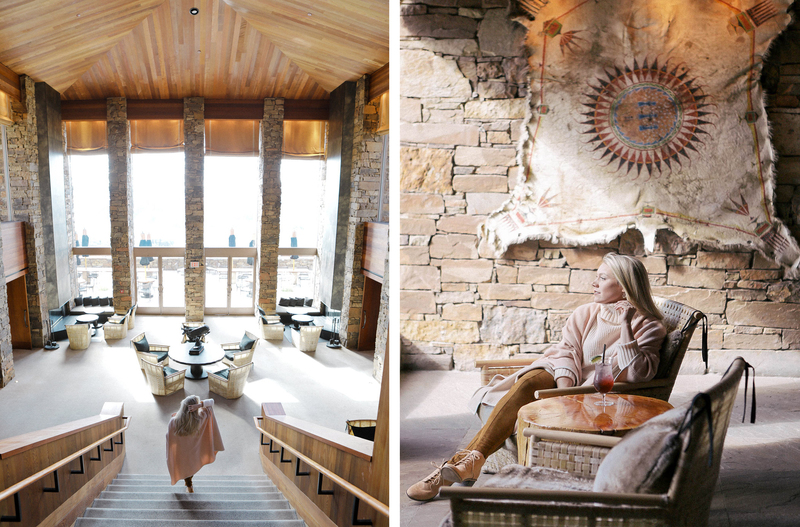 We began our trip in Jackson, Wyoming, where we were guests of a place straight out of my dreams. 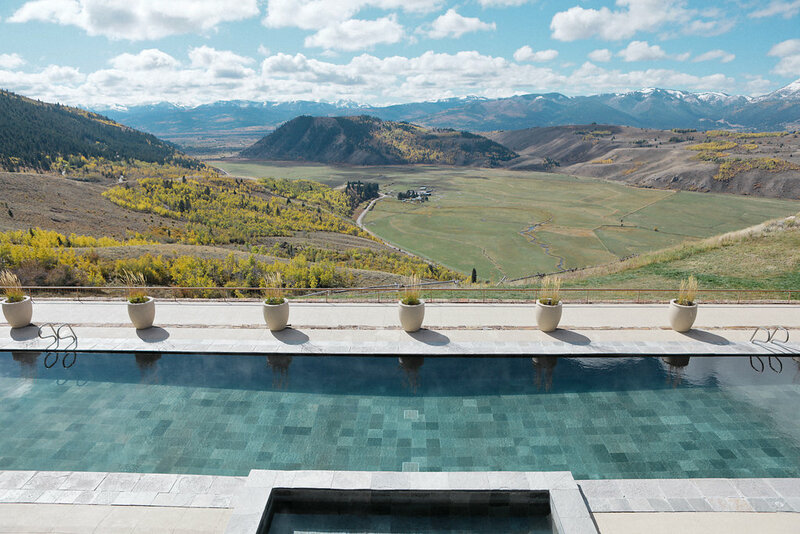 This place is Amangani, a resort whose name means “peaceful home” and whose location is perched on the cliffedge of a butte in the Jackson Hole valley in Northwest, Wyoming. 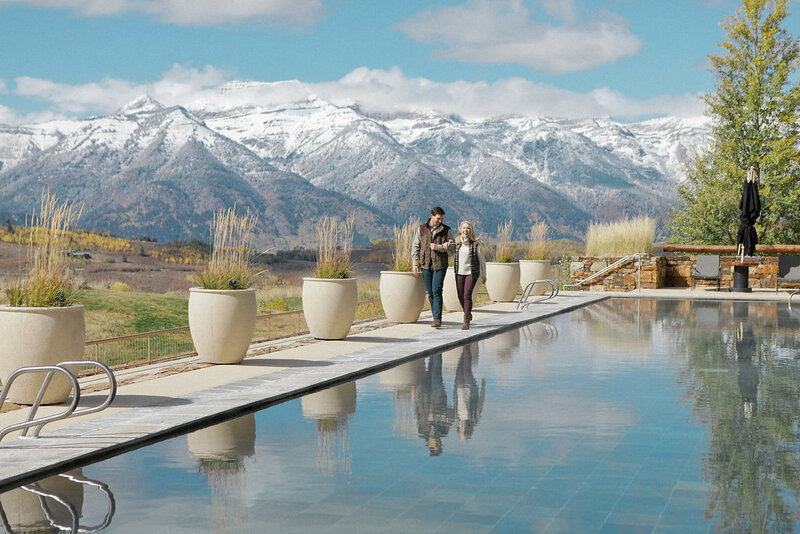 Nearly 7,000 feet above sea level, Amangani offers panoramic views of the Teton Mountain Range, the youngest subrange of the Rocky Mountains. 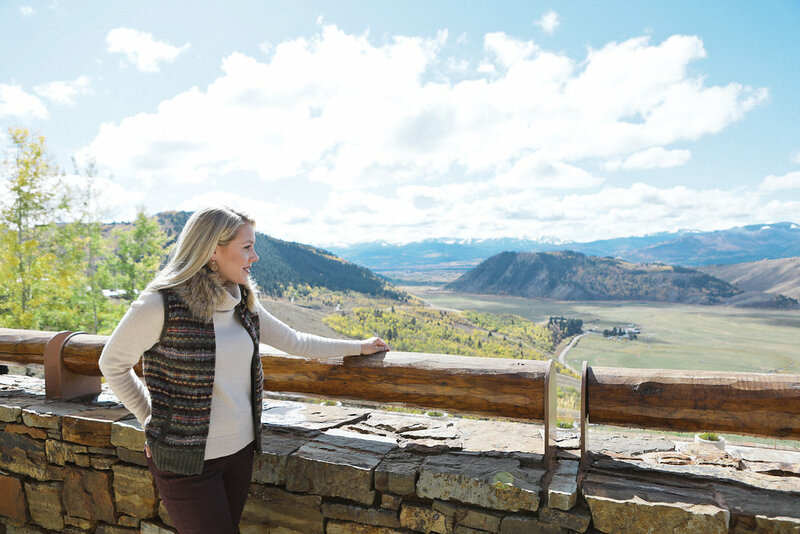 And though isolated, the charming cowboy town of Jackson, Grand Teton National Park and Yellowstone are all easy drives away from the resort. 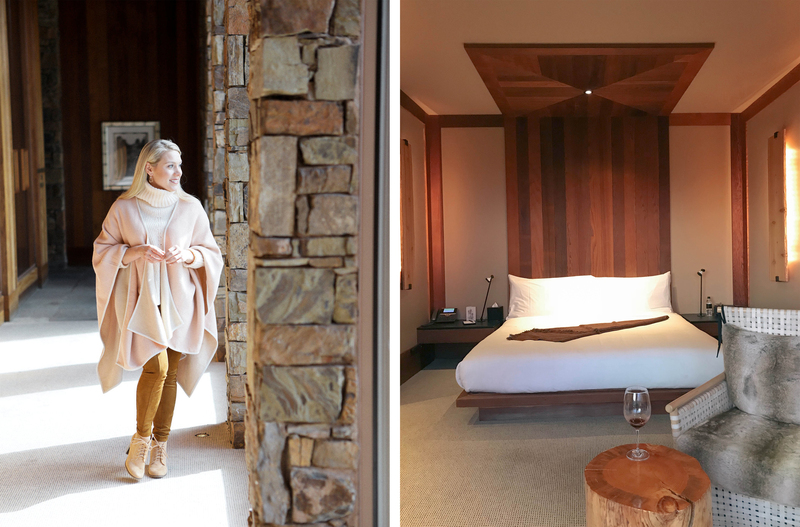 Amangani was Aman resorts first North American property and is the truest contemporary take on luxury I’ve ever had the pleasure of experiencing. 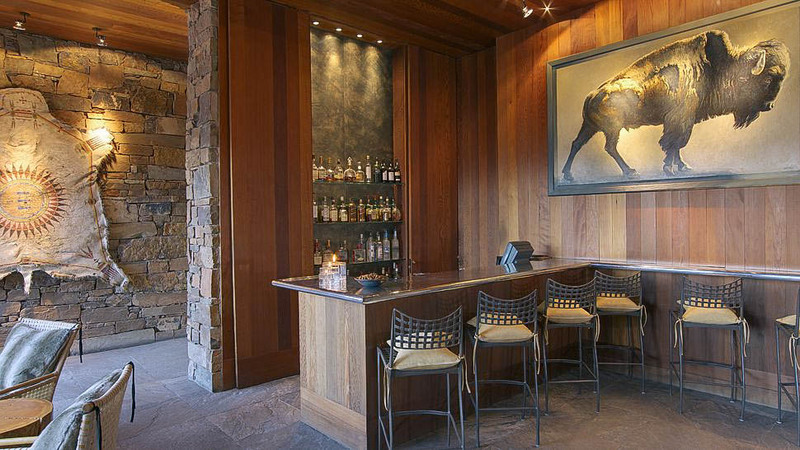 Every detail is an expression of the surrounding countryside that inspires its design; a feeling of modern Western elegance that is warmly intimate and yet refined – think minimalist, with natural sandstone, redwood ceilings, textured fabrics, unique wood furnishings and sparingly used Native-American motifs and designs. 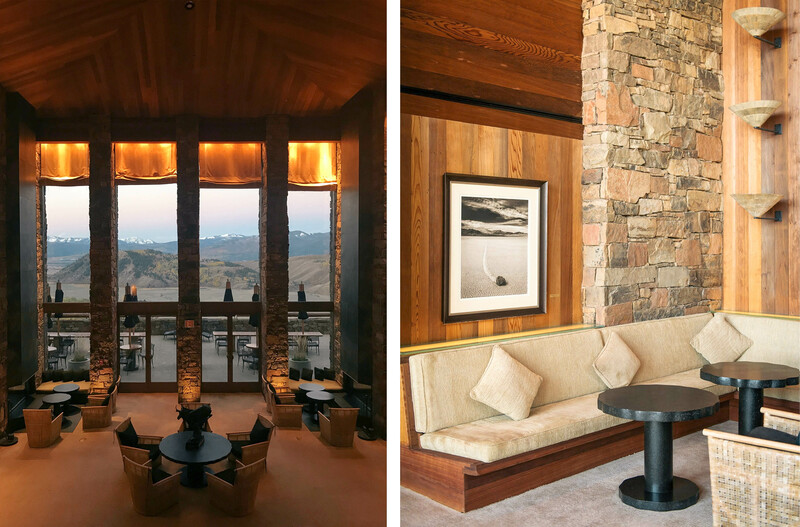 Upon entering Amangani’s grand entrance, steps sweep dramatically down to a lounge, two-story floor to ceiling window wall, wood-burning fireplaces and the most breathtaking views of the snow-capped mountain range. Each morning, Justin and I would enjoy breakfast from one of the two fireplaces in the lounge where we would relax and chat with the staff about what to do and where to go while visiting Jackson. Each of the 40 suites are specifically designed so that the bed, bath and balcony faces a majestic view, something that is characteristic of all 31 Aman properties dotting the globe. 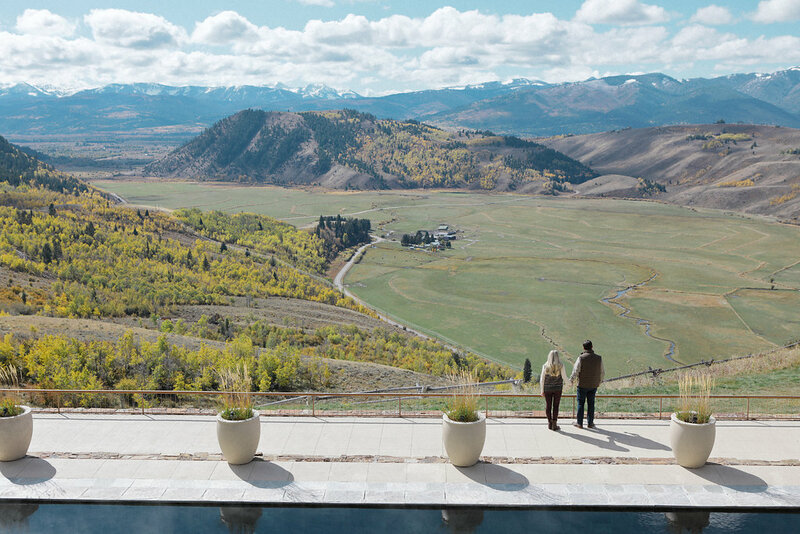 Our balcony overlooked the lush Snake River Valley with an incredible view that was framed with bright yellow aspen trees. 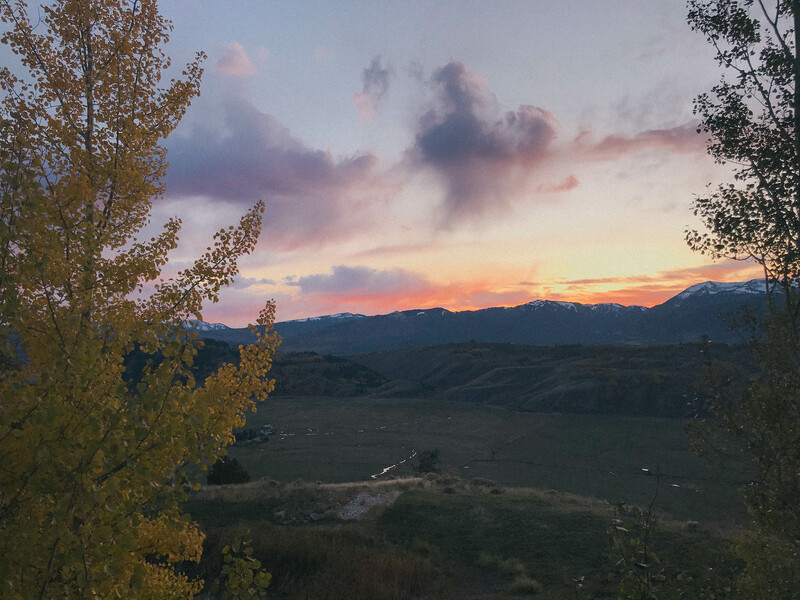 Justin and I would wake up early every morning to watch the sun rise overtop the mountains; as evening fell we would open a bottle of wine and watch the fog settle in the valley. Come sunset, the cattle in the grazing fields below were quite social and you could hear their moo’s echo from above. It was such a sweet sound and perhaps something I looked most forward to each day. Wyoming is a hiker’s playground when not covered in a blanket of snow. By the second day we were anxious to stretch our legs and hike the famous Death Canyon Trail, a six mile hike that takes you down by Phelps Lake Loop. I recommend making a pitstop beforehand at Creekside Market and Deli for sandwiches and a can of bear spray (a must when hiking in bear country). Justin and I ate our sandwiches alongside the waters edge of Phelps Lake, something I highly recommend you do too. 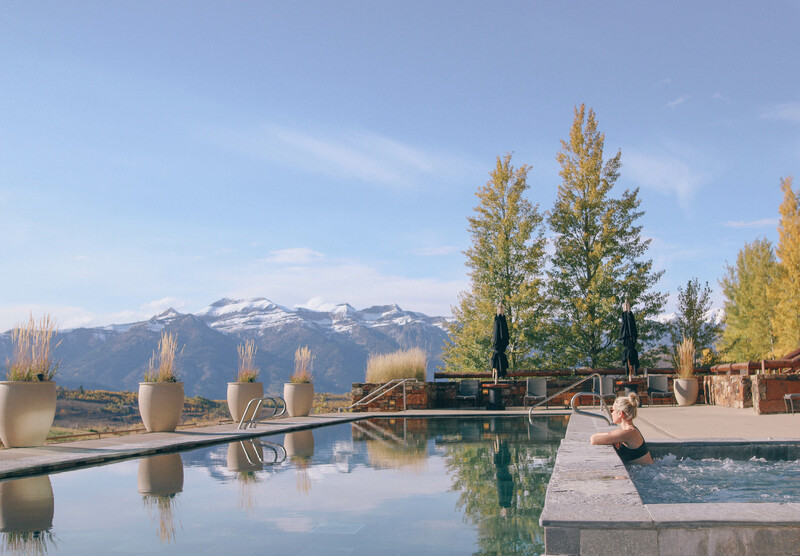 After a morning hike, you could find me relaxing in Amangani’s outdoor heated infinity pool and spa. The unobstructed views are something spectacular and an experience I will always remember. 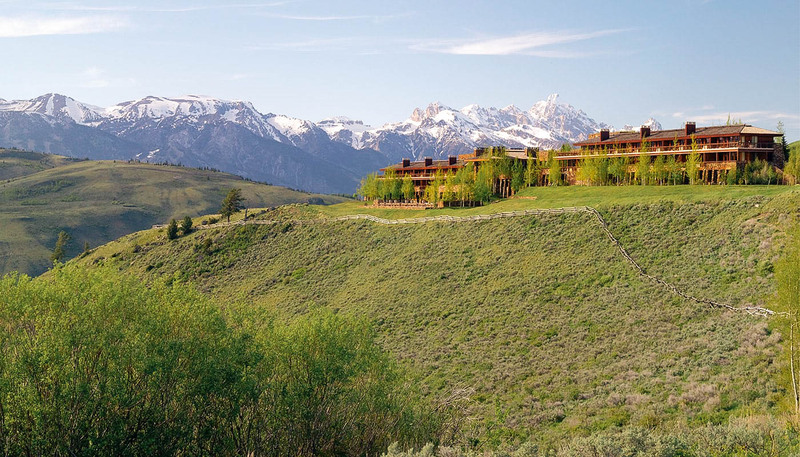 Renowned as one of America’s top hotels, Amangani is an experience unlike any other. Justin and I had done a great deal of research beforehand and with vibrant autumn foliage, active wildlife and fewer crowds, we decided this was the ultimate fall destination. 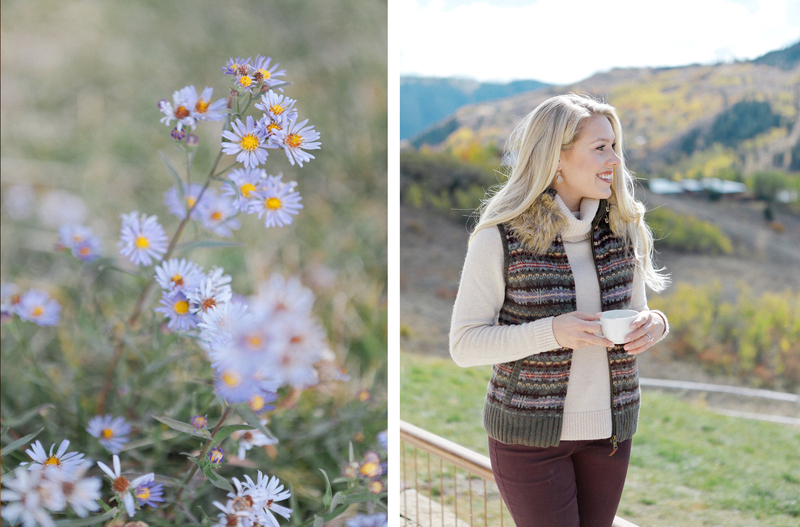 Though I hear there are no shortage of things to do in any of the four seasons throughout the year, this is a time when the aspen and cottonwood are gold and red, the air is pleasantly crisp and cool, and the skies are almost always blue. The resort offers all sorts of activities and the staff are always eager to suggest hikes, activities and recommend local, hidden gems. My experience at Amangani was an unforgettable one and if you ever get the chance to go, take it! If you have any questions, please don’t hesitate to ask. I love sharing my experiences and information in hopes to make your travels seamless and unforgettable. I’ve received a lot of questions about our trip and wanted to give those of you reading this post a run down of how and when I will go about sharing everything. 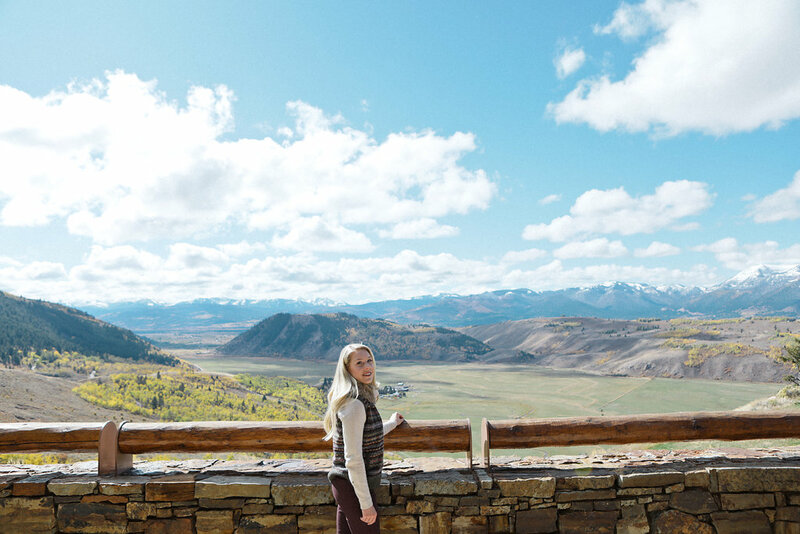 I wanted to first review two of the properties we stayed at (Amangani and Under Canvas), followed by a Jackson Hole Travel Guide and then a complete review of our entire road trip – a map of our route, the different national parks, tips for those visiting in the future and fun memories that made it really special. Please do ask questions. This opportunity was in partnership with AMAN resort; however, all opinions are my own.